The 2019 Progressive Miami International Boat Show is just a few days away! From February 14 to 18, the Miami Marine Stadium will be transformed into a dazzling playground of all things boating that will delight every boater and boater at heart. The Miami Yacht Show will also take place from February 14 to 18 at One Herald Plaza, catering to those seeking nothing but exquisite luxury. This year, InterMarine is proud to have its largest Miami Boat Show boat line up to date: 57 boats and yachts from all our manufacturers will be on display at the Miami International Boat Show this February. This is the largest and most ambitious display we've had in our 24 years in business as one of South Florida's most established boat dealers. There certainly is a boat or yacht for everyone. Boaters can buy a new boat or new yacht from our curated selection of runabouts, classy luxury outboards, fishing boats, cruisers, rigid inflatables, deck boats, express cruisers, and yachts from superior brands like Chaparral, Jeanneau, Four Winns, Wellcraft, Nuova Jolly, Belzona, and Prestige Yachts. All sixty-two boats were selected for a reason: they fulfill a need in a certain sector of boating, they offer the best value, and we believe they bring the most fun out of boating. Among those sixty-two boats, there are seven that we want to highlight, plus two yachts that will be at the Miami Yacht Show. First on our list is the new 300 OSX from Chaparral. This is the first-ever twin outboard center console from Chaparral, and it is HOT. The Chaparral 300 OSX marries performance and Chaparral luxury. We can't wait to show you this one!! Land booth A141. The award-winning VR5 got even better with an outboard motor edition. This is the perfect entry day boat for just about anyone. Stadium booth 201. Belzona boats are built in Miami for the Miami lifestyle. These elegant and edgy boats offer features that are aligned with our South Florida lifestyle. They get it! Stop by land booth B201 to find out more. The Nuova Jolly Prince 38 offers a level of comfort that is unprecedented in rib boats. Sturdy, comfortable, and roomy enough to entertain all your guests, Nuova Jolly's Prince 38 RIB will amaze you. Land Booth C205. This was one of the hottest boats at the Fort Lauderdale International Boat Show back in November. This beauty shows off its Beneteau DNA with its elegant lines and practical layout. Don't miss this one. Water slip 625. This is one of our best-selling boats here at InterMarine, and you can buy your own Jeanneau powerboat at the Miami Boat Show. Spacious and airy, this elegant express cruiser is made for life on the water. Wellcraft describes its boats as "Fishing Machines". Need we say more?? We do, actually. This serious fishing boat from Wellcraft not only comes equipped with a tower but it is loaded with luxurious details throughout to keep non-fishing company happy too. It's a win-win. Come take a look at the Wellcraft 352 Fisherman in Land booth A225. The Miami Yacht Show, which runs concurrently to the Miami Boat Show February 14 to 18, is debuting its new location at One Herald Plaza in Miami. This new yacht show location, just north of downtown Miami by the Adrienne Arsht center, is really in the middle of the action. The Miami Yacht Show features the world's most extraordinary and uniquely designed yachts and superyachts from the world's most important custom boat builders. The Prestige 460 is an impressive compact yacht that offers buyers luxurious features normally found in larger yachts. Owners of the Prestige 460 yacht enjoy a massive flybridge, Master stateroom and a VIP stateroom, hydraulic platform, innovating seating throughout, optional transom grilling station, and much more. Miami Yacht Show Slip 642. Another home-run for Prestige Yachts, the gorgeous Prestige 590 yacht bridges the space between the beloved Prestige 520 and the Prestige 60+ yacht line. Its clean, elegant lines and brilliant details (like the mirrored salon doors) make this spectacular luxury yacht from Prestige truly a thing of beauty. Do not miss this one. Come see it at the Miami Yacht Show at One Herald Plaza in Miami, Slip 642. Tickets to the Miami International Boat Show can be purchased here. Tickets to the Miami Yacht Show can be purchased here. Both shows start this Thursday, February 14 and run through Monday, February 18. This is the best time to take advantage of stacked incentives from manufacturer and dealer and enjoy outstanding boat show specials. Buy your new boat or new yacht on sale and save lots of money. Visit the show and treat your eyes to the gorgeous scenery of boats, yachts, and accessories- not to mention the natural beauty of Virginia Key, where the Miami Marine Station is located, and the cosmopolitan vibe of downtown Miami at One Herald Plaza. 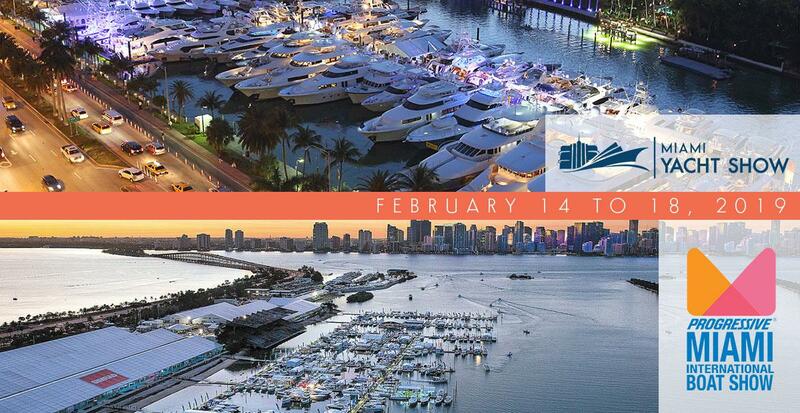 Do not miss the Miami International Boat Show and the Miami Yacht Show this February! See you at the show!